Hello-Hello, welcome to an almost-weekend here in the Corner Condo at the Prepatorium. Talk about living the Vineyard Vines lifestyle. The nautical-inspired brand has partnered with Lark Hotels, a boutique hotel group with properties throughout coastal New England, to create two guest suites. Below, a suite at the Captain Fairfield Inn in Kennebunkport. The suites mix the brand’s coastal preppy chic touches with the modern influences for which Lark Hotels is known. Pillows and bed bolsters are made from boardshorts material, and the edging on the window shades is from Vineyard Vines belts. Another part of the suite. The Captain Fairfield Inn is the first Lark property to have suites with VV decor. Next to have the Vines treatment: 76 Main on Nantucket. That property’s grand opening is June 9. This isn’t the first interaction between the two brands, Lark employees are outfitted by Vineyard Vines. More from the Lark blog. From managers to housekeepers (and even friends and family! ), you’ll see the crew at our hotels decked out in stylish vineyard vines dresses, khakis, polo shirts, tunics and capris. Lark’s other properties include the Attwater in Newport and the historic Danforth in Portland (Maine). Our other tidbit involves Friday Fun of the Four-Legged kind, we wanted to share more preppish duds for your pooch. The madras coat is by ParsonsDesignGrad on etsy. The shop owner and design whiz got in touch last week about her creations and I just fell in love with them. One of the niftiest things about the coat is that it is reversible, the flip side of the oh-so-snappy madras is a lovely repp tie stripe. The coats are made from re-purposed and upcycled vintage linens, there are some wonderful patterns available. If interested in visiting the ParsonsDesignGrad etsy shop, just click here. We also stumbled across some new styles while endlessly grazing studiously reading some of today’s offerings at Fab.com. These are by Preppie Pup, available at Fab, there are definitely some ‘fashionable’ looks. Seeing these dapper styles reminded me of the posts we’ve done showcasing The Rover Boutique. Below, some of the images we have previously shared. There are new styles at the Boutique, including the Fieldwork Raincoat. This one has a bit of the Barbour touch, don’t you think? Just in time for spring, the Boutique also has some cute new bowtie collars, like this seersucker style, definitely today’s Pretty in Pink. On that cheery note, g’bye until next time! Hello-Hello, and happy middle of the week. “Polo shirt” has become a standard name — like “T-shirt” or “khakis” — to describe a knit shirt. But after recent visits to my college-age children in Alabama and Virginia, I’ve learned there’s a zoo full of animals adorning the chests of students on campuses throughout the South. The writer, Sara Busse, brings up a little family history in the article. My dad, far from preppy and not a golfer or a tennis player, wore the little penguin shirts (by Munsingwear) around the house on Saturdays. Now Brad Pitt wears them. Dad was cool. Go figure. Here is a 1970s era shirt like the one Ms. Busse describes. Look for Southern Proper’s Labrador retriever, or Southern Point’s German shorthaired pointer. These will set you back $75 or so. If you like bigger dogs, Southern Dignity is set to launch a Great Dane-embroidered shirt just in time for Christmas. A brand that certainly would have fit on the list would be Loggerhead Apparel. For a more in-depth look at the history of the shirt itself, Ivy Style offers ‘Le Crocodile: How Lacoste Became the Preppy Polo of Choice and Kyoto Maiko has a post on the topic as well. We were familiar with most of the brands discussed in that graphic up above, but always enjoy learning about new companies. Here is a name that was new to us, Mahi Gold, offering styles ideal for wearing “from the boat to the beach to the deck to the bar.” Below, the Seaview Shift in both aqua and pink, the Claire dress, and on the far right, the Coastline Dress. The company was started by brother and sister Michael and Becky Gorman, we like knowing the collection is Made in the USA. Another plus – everything is crafted of soft (but durable) organic cotton with a touch of Lycra for stretch (and comfort). They even have dresses available for your little one, below we show the Seaview Shift Dress for Girls and Toddlers. To see a list of stores where you can buy Mahi Gold products, click here. Our other item today, a reminder about Sunday’s launch of the Jason Wu for Target collection. Because the much-buzzed-about collection is only being carried in ‘select stores,’ Targét has even created a a Facebook page listing stores by zip code that will carry the line. 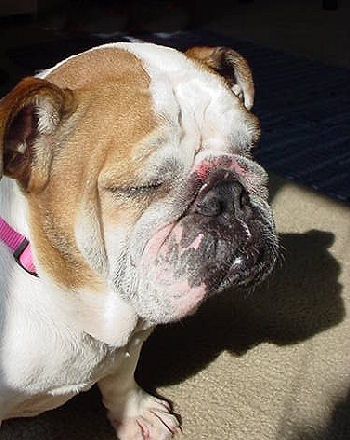 Target’s online photos are delightful. Last week the company celebrated with a big do, below we see Gossip Girl’s Blake Lively and Chloe Moretz in pieces from the line. A quick reminder about our Jack Rogers Giveaway, if you haven’t already entered, scoot on over and do just that, entries close at midnight on Friday. Hello-hello, welcome to another crazy day at The Prepatorium. Business commitments mandate brevity today (it is turning into “one of those weeks”), so we jump right in with a story about something near and dear to many prep hearts, embroidered critters on everything from clothing to key fobs. “Not all critters are created equal: Dogs and waterfowl are popular, but cats barely make it onto the radar — at least when it comes to creatures featured on the preppy clothes and accessories that seem synonymous with spring. Below, ties from LL Bean, the blue is decorated with a deer and the moss green is adorned with a trout. The story is by Samantha Critchell, it has run in a number of papers already; here is a link to the piece in the Fall River Herald News. A pair of men’s Embroidered Whales Club shorts offered at VV. Mr. Murry talks about the company’s new Kentucky Derby collection in the story, explaining customers will be seeing a lot of horses this spring. Below, a belt from that collection. 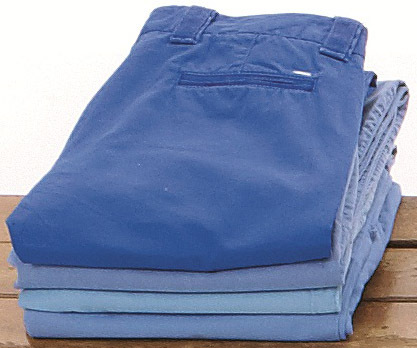 Brooks Brothers is also offering whales this spring in the Clark pants, the Seersucker Capris are available for the ladies, embroidered with lemons. “He said he’s going to revisit cats at some point since he personally is a cat person, but, again, it’s the issue of shape and color. Can you tell a book by its critters, so to speak? The article is very well done, to read it in its entirety, click here. We are curious, do you wear embroidered clothing or accessories? What’s your favorite critter? An image from the spring catalog. Eddie Bauer faces a challenging environment, it is recovering from not just one, but two bankruptcies since 2003. Getting those of us once fond of the brand back into a store will be even more daunting. For both The Consort and yours truly, this is a case of feeling like the brand left us, we didn’t leave the brand. Below, a look at one of the newly reformatted stores. Reclaiming lost customers while also growing new fans is a key part of the company’s strategy moving forward. It is unlikely we will go out of our way to shop at Bauer, but knowing how hard the company is working at re-invigorating the brand, we may peek inside a store. We leave you with a bombshell. In fact, a personal admonishment to TQM: please seat thyself before reading further, lest you tip over from the shock. ABC will debut two new daytime programs this fall and winter: “The Chew,” a program about food news and trends, and “The Revolution,” about health and lifestyle transformations. 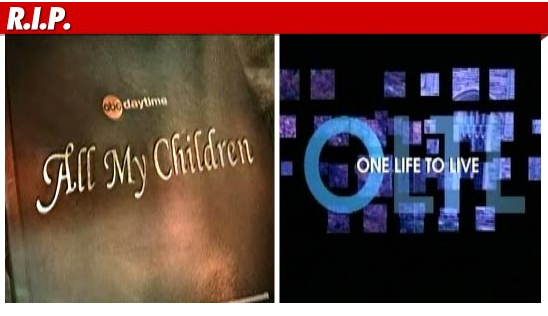 One Life to Live has been on the air 43 years, All My Children for 41 years. Good bye Erica. Goodbye Pine Valley. Hello-Hello, and Happy New Week to everyone! We begin with a look at one of the WSJ stories we enjoyed reading in Saturday’s paper, “The Return of the Ivy Look“. In the story Darrell Hartman looks at the style’s recent rise in popularity among those generally attracted to more mainstream fashions. Mr. Hartman discusses the resurgence in popularity for what many call ‘heritage brands,’ those mentioned above as well as others, like Brooks Brothers, while also considering some of those new to the genre, including Polo Ralph Lauren and Band of Outsiders. Below, two pieces from Band of Outsiders. “That species is the revered subject of “Take Ivy,” an influential study of elite Northeastern campuses published in 1965 by a team of fashion-savvy Japanese writers and photographers. For years a cult item among fashion insiders, the book was finally released in U.S. stores (including the ever-trendy J. Crew) this summer, flooding the menswear world with images of wholesome-looking ’60s undergrads bent over books in libraries, strolling across leafy quads and—perhaps most importantly—demonstrating a robust enthusiasm for sports. There’s much more info and insight in the WSJ story, we happily recommend this one, it is a good read. The book cited above, Take Ivy, was discussed at length in many articles, The Daily Mail offered The Ultimate Guide to Ivy League Chic Straight from Japan last fall. “Written around a collection of photographs by Teruyoshi Hayashida, Take Ivy proves how little the look has changed over the past 50 years. BTW, if interested in Take Ivy, we still have a limited number of copies, the book may be found here. Next, we wanted to share a few styles from the upcoming collaboration between designer Sophie Theallet and Nine West. Many of the styles are definitely Pretty in Pink, these pieces are made with a silk repp stripe. We are very impressed with the ballet flats, the styles will be available in more than just the pink color palette. The collection is slated for a May launch. Frequent readers know we have a fondness for Kate Spade, the styles are attractive and the company’s whimsical approach to marketing is a breath of fresh air. Another reason we like the company? It’s open approach to online sharing. Above, an illustration for one of many free cyber Valentines that may be sent to anyone you choose; below, a look at how a full card appears. We show the artwork from two more cards below, but be assured there *are* many designs offered that are not pink, click here to peruse the pretty options. Our thanks to the one and only College Prepster, Miss Carly, for the original tip on this! A quick note of the social sort for those near our nation’s capitol next week, Vineyard Vines is throwing a party to launch its spring collection. V2 has partnered with our friends at Sky Blue Events for next Wednesday’s do at the retailer’s new Tyson’s store; the fun begins at 5pm, click here for more info. We leave you with two quick hits, the first involves this weekend’s bright and sunny Lilly fashion show at the Ringling Museum of Art. The show was a fundraiser for the Museum, and the always delightful She Blogs Couture by the Sea was in attendance and shared *outstanding* images of the event on her blog. The second comes to us via a gracious reader. Last week we showed the Sperry Top-Sider keychain in a post, but sadly, it sold out very quickly. That generous reader told us about these Rainbow Sandals Keychains. We want to thank our kindly commenter for the link. And with that, we say goodbye until next time. Well, hello there. Did you say sunny and 75? Sadly, if you were hopeful of a completely escapist post sans any mentions of the “S word” or “B word”, we are destined to disappoint. Both of us have spent much too much time in Chicago (The Consort lived there for several years) to allow complete avoidance of last night’s storm. Below, a view of Lake Shore Drive last evening. “With snow caked over the windows of his Honda, he called 911 for help. The dispatcher told him to use his best judgment. Lake Shore Drive remains littered with abandoned vehicles, above we show the road this morning. Below, a CTA bus that had to be abandoned. Passengers were rescued after six hours. Here is another look at LSD today, this one via ChicagoPhotoSho. The picture is rapidly going viral, perhaps because of its post-apocalyptic feel. “Jim Kaczmarek said he was not rescued until 8:30 a.m. after spending more than 17 hours trapped on the drive… He said he called 911 several times, and was told officials were aware of the problem but couldn’t do anything about it. Mr. Kaczmarek also says he realizes he never should have gotten on Lake Shore Drive to begin with. There is much discussion today about whether or not the City should have closed the road earlier, for more, click here for the Trib story. Below, how Chicago firefighters got around. We are more-than-grateful to be inside, warm and dry. On to our primary topic today, news of “Prep World,” a collaboration between author best-selling author Lisa Birnbach and Tommy Hilfiger. The True Prep author and Mr. Hilfiger are launching a capsule collection with that moniker. The marketing campaign includes what some call a “pop-up shop,” in this case one inspired by a Hamptons cottage. Lisa Lockwood at WWD (Women’s Wear Daily, subscription req’d.) was first with the story yesterday, “A Marriage Made in Preppy Heaven“. Here are some of the photos accompanying the article. More pieces in the upcoming collection. We do like the look of these shirts, no surprise to those already familiar with our fondness for madras and nautical looks. 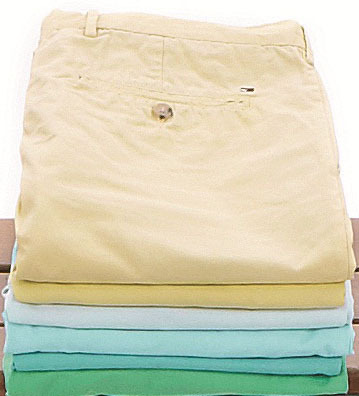 There are polos shirts in a rainbow of colors. “Interested shoppers can get their hands on the goods when the roving store opens in New York on April 28th. But, please, don’t be so vulgar as to call it a “pop-up.” Others pop; true preps “drop in. Women’s merchandise will run $35-$298, the men’s line will be priced at $45-$178; the chinos also have appeal. We have seen the new line referred to as a “True Prep” collection, although we believe the proper name is simply “Prep World,” among other things, Vineyard Vines already has items showcasing the True Prep name. Many of the new styles look promising, while others are clearly not for us. Tee-shirts proclaiming “prep” simply don’t work at the Prepatorium, nor do logos. Of any kind. Yet there are many items we saw with classic lines and appeal. The collection mirrors our ongoing conundrum with Mr. Hilfiger’s merchandise, sartorial confusion perhaps best described in this post from last fall about the designer’s runway collection for spring 2011. Our post went on to say the looks were surprisingly attractive, as we had long ago relegated the designer’s work to nouveau-prep status, verging on Anti-Prep territory, it was that hideous. But many publications have noted Mr Hilfiger’s efforts to “re-invent” his merchandise, we imagine this is part of that effort. Daily Front Row also wrote about the upcoming line. (We do carry True Prep at The Princess, and have also done multiple interviews with Ms. Birnbach, click here and here for a sampling of the of those posts.) Below, springtime candy colors from the collection. Here is a look at some of the creative you will see in the upcoming advertising campaign. We cannot do a post without marking the significance of the day; we simply must note that there is Punxsutawney Phil and then there is Punxsutawney Till. Our other whimsical tidbit comes via our friend Christian over at Ivy Style.